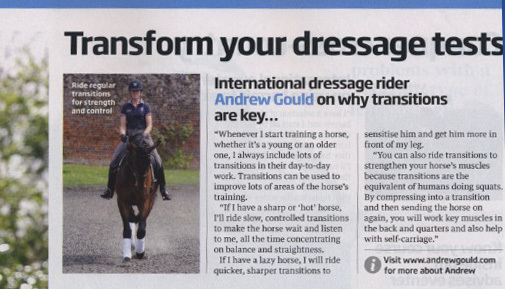 At the beginning of 2009 Andrew has been asked by the British Dressage Scottish Committee to help train the British Dressage Scottish Region Rider Development Group. 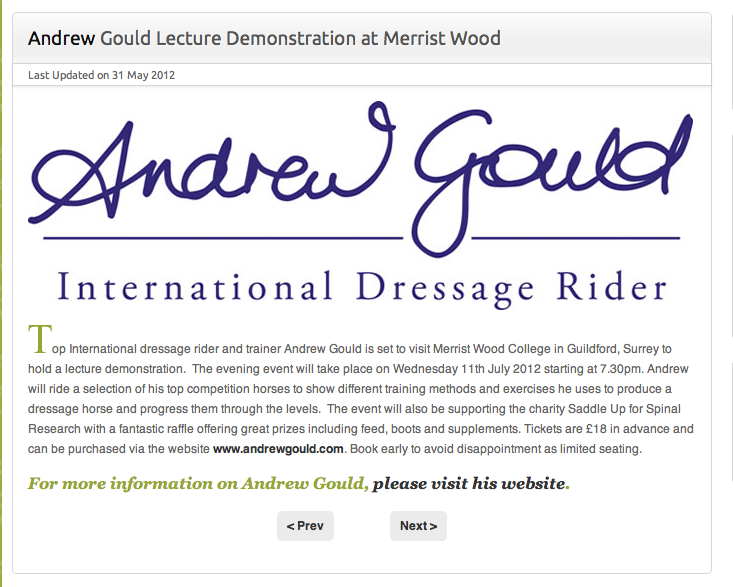 Thirty riders aged from twelve to twenty-five who had achieved good individual and team results during 2008 were invited to come forward for a riding assessment with Andrew before a final selection was made. 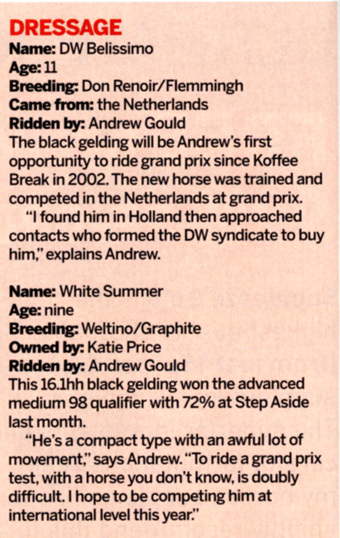 There are still five riders to be assessed by Andrew in February. 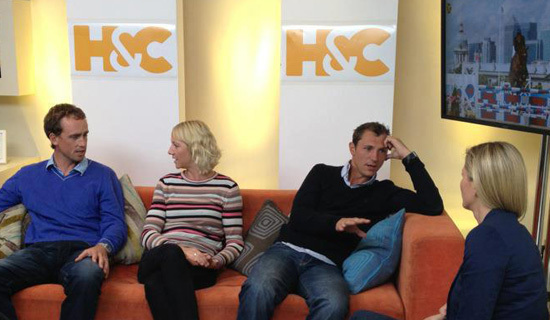 A final selection of ten riders will receive funding from the Scottish Region towards training with Andrew during 2009. 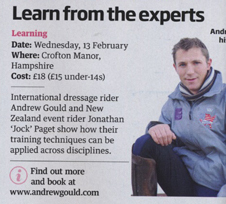 It is hoped that together the committee and Andrew will starting a pathway for up-and-coming riders to then move on towards national training. Assessments for funding for 2010 will be made with Andrew in October/November 2009. On Thursday 15th January Andrew took Jordan's Spirit Forever, owned by Katie Price, to his first competition since Katie bought him last October. The new horse was bought at the Equine Elite Auction in Holland and is a rising 10-year-old KWPN gelding by Cabochon. 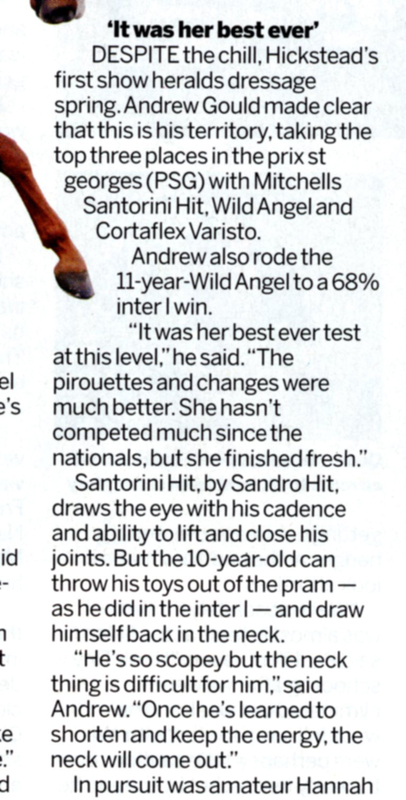 Andrew was delighted with how Spirit performed and believes the horse has a lot of potential. Owner Katie Price was at the show at Addington Manor to watch him compete and is looking forward to competing him herself in the near future. 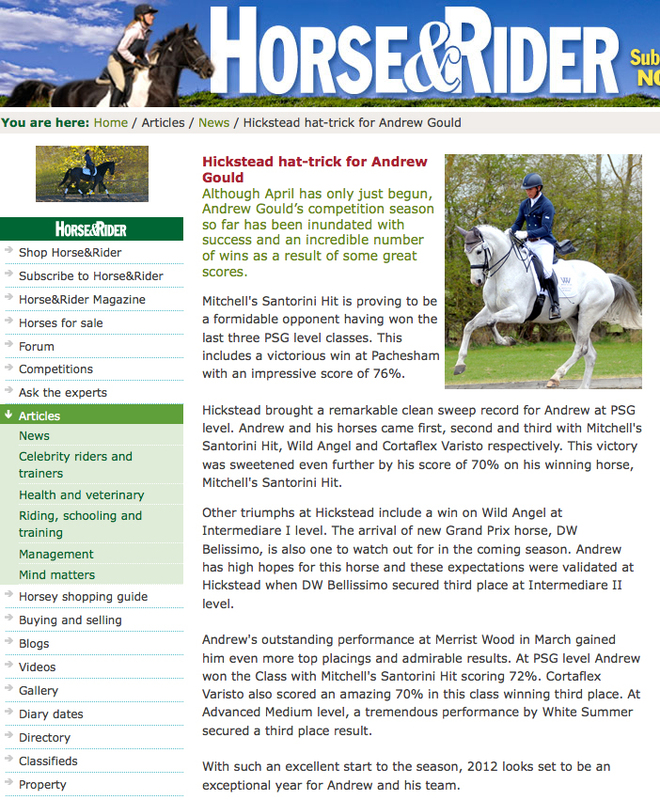 Last week Emily Stanford who is based with Andrew won three out of four classes at Addington Manor. She took both the Elementary Open classes on her 7-year-old mare Korenbloem Vincit Omnia and won the Medium Open on Pagineta. Emily has been working hard over the winter with Andrew, training the horses and she has developed a great relationship with both horses. Emily went on to win the Elementary Open at Patchetts Equestrian Centre the following week on Korenbloem Vincit Omnia taking her nearer to Summer Regional Qualification. Emily Baldwin, International Event Rider and member of the World Class Potential Squad trains weekly with Andrew and her exciting string of horses for this season. She headed to Oldencraig to win the Medium Open and the Advanced Medium proving her winter dressage training has paid off. Emily is now excited about the forthcoming eventing season and feels very positive about how her horses are performing on the flat. 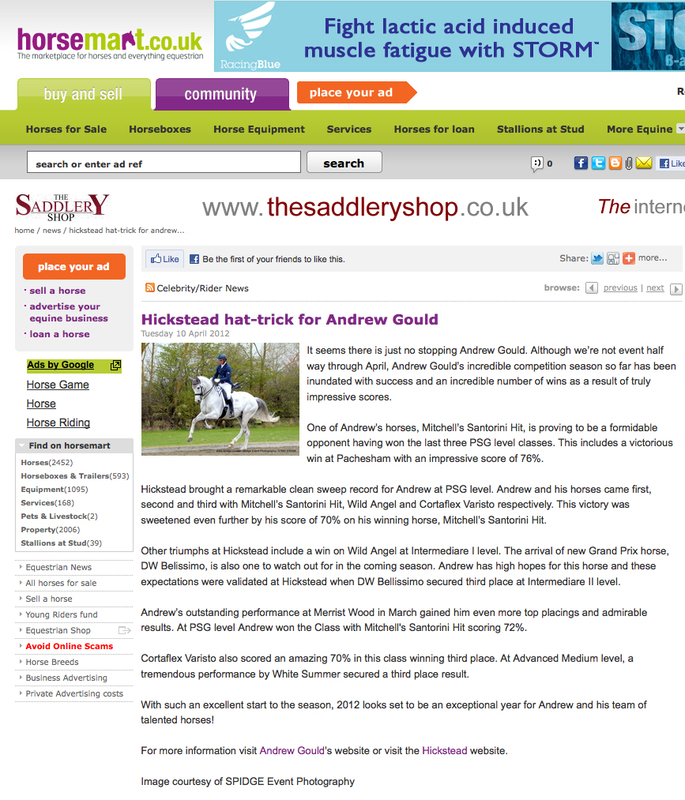 Andrew and Daniel Timson are practising hard for their appearance at the Showjumping British Open in April. The pair are performing a Pas de Deux on the Thursday and Friday night at the Birmingham NEC. 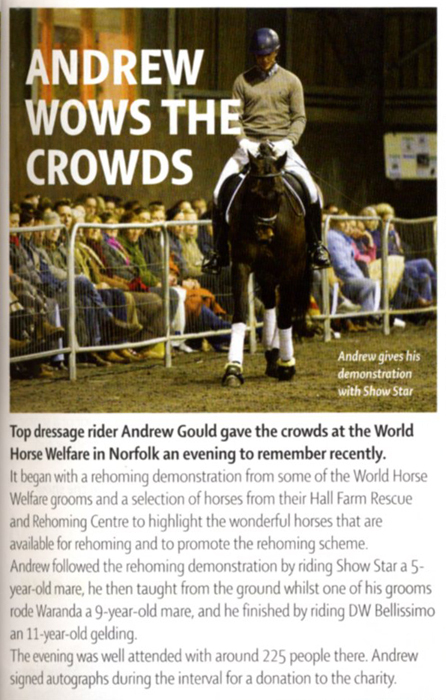 Please click on the latest leaflets to download and find out more about the show.